Tip: Use the interlocking handle and not the trivet that comes with the cooker. Please use both hands while placing in and taking out the stacked pans from the inner pot to avoid spillage of liquids or foods from the pans. MULTI FUNCTIONALITY: Two tier stackable stainless steel insert pans allow you to cook a variety of foods simultaneously for efficient usage of limited space in the pressure cookers. Steamer Pan is ideal for steaming vegetable, egg etc. The regular pans are perfect for rice, beans, chicken and also be used as a dessert pan to make cheesecake. The complete set is intended for Pot in Pot PIP cooking. Great for storing food. 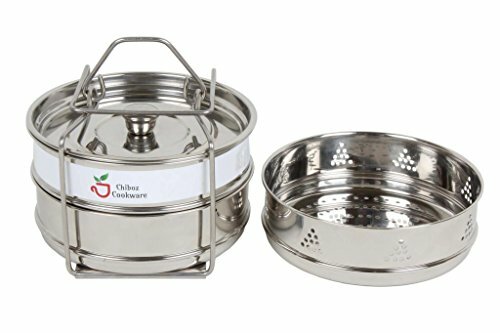 FITS 3 Qt Mini COOKER - The Chiboz Cookware stainless steel cooker insert are compatible with 3 quart mini. Steamer pan could be used in a time saving mode(please read product description below) 6 qt users can use the product as 3 tier without the interlocking handle. 100% MONEY BACK GUARANTEE - Chiboz Cookware products come with total satisfaction guarantee, in the unlikely event if you are not happy with our product. If you have any questions about this product by Chiboz Cookware, contact us by completing and submitting the form below. If you are looking for a specif part number, please include it with your message.